After watching Aruanda, a dvd by CDO London group (Mestre Poncianinho) – I friended him on Facebook, and came across Mestre Cobra Mansa’s Kilombo Tenonde Permangola. “Directed by “Mestre Cobra Mansa” this center combines the art of Capoeira Angola with the practice of permaculture through a series of activities, events and volunteer opportunities. Together with local farmers several activities are also held encouraging the production of agricultural products without the use of chemical pesticides and fertilizers (including: cacau, canela, cravo, urucum, dende, guarana, manica, jaca, legumes and more). 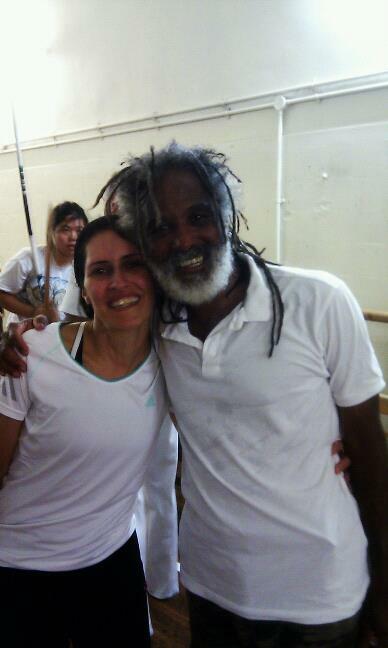 Mestre Cobra Mansa was also collecting money through crowd funding to make a film about the origins of capoeira and the berimbau, and I donated to the project: Angolan Roots of Capoeira, via Indiegogo. So, through those Facebook connections I found out that the very legendary Mestre Cobra Mansa was doing a workshop on Friday 03/04/2013, and also a whole weekend of workshops in London. I was also familiar with Mestre Cobra Mansa from watching a dvd of him playing various games at DDL, before class. Given all the work he has done, most people who have been doing capoeira for a while know about him. He’s a greatly respected Mestre, perhaps one of the most influencial of his generation. So, on that Friday I made the convoluted journey from Tooting to Fulham Broadway. In terms of distance, it’s a mere 4.3 miles, on an almost straight line. So I thought about driving there, but looking at the googlemap photos of the surrounding streets I soon realised (aided by my husband’s ability to decipher obscure road signs) that parking would have been impossible, it’s mostly permit holders only, even in the evening. As was tradition, I got on the train that left last, after joking with the platform attendant about which would leave first. He said he better not tell me, as he would get it wrong, then pointed me to the one that ended up leaving last. It was always a gamble, getting in the right train did happen occasionally but not this time. The train was moving so slowly, I ended up being 20 minutes late, just as the workshop was starting (due to start at 6:30, but I guess they had to do registration and get set up, they rent the room, so can’t even arrive early). I walked into this big dance studio (30 by 10 meters I think), full of people, maybe one hundred, maybe more… Music was playing, I walked to the front and spotted Mestre Cobra Mansa! And then we were told to spread out around the room. started with ginga and balanco, facing the mirror. Disconcerting, as I’m used to training without a mirror. We are all singing along to the capoeira songs being played. About 10 mins go by, I’m already dripping with sweat, we then stop, switch, some people go play instruments and the ones who were playing come over to do the movements. Being my first time there I wasn’t sure if I was allowed to play so I stay put. The room was packed and we kept bumping into each other. A good way of learning about space awareness but rather disturbing and disorientating. We are then told to go into pairs and do the sequence below, and I pair up with a woman wearing a wooly hat, who the kept telling me to go fast, but I’m thinking: the music is slow, this is Angola, we need to go slow? So I tried to move with the music. And I kept thinking, does she wear a wooly had to stop frizzy hair? That’s the reason I always have to wear a hair band… Brave of her to wear a wooly hat though, it’s very hot. We are moving across the room while we do this one. Cobra mansa stops the music and shows the above sequence again. He says we need to ensure we make the move as a response, and NEVER try to predict what’s coming next. Assumption is the second biggest mistake in capoeira. The first one is not looking, says Mestre Cobra Mansa. So we swap partners, I’m now with a tall, strong and friendly man, who is wearing a vest – funny the things you remember. We do the same sequence as above, but on the same spot. One of the instructors comes to watch us do the sequence, and I look away at him for an instant, when I look back my partner’s foot very close to my head, I move out of the way quickly. I get a knowing look from the instructor and we laugh. player 1: rabo de arraia, switch, rabo de arraia the opposite direction. We swap again, and this time I go and play the agogo for a bit. It’s nice to sing and relax for a while. We are not singing loudly at this point. The man in the harem pants pulls one of my legs while we do the sequence, making me land in esquiva. He has just demonstrated that my 2 years of training have paid off, as I know now how to fall even when caught by surprise. I was indeed pleasantly suprised that I had landed like that! I return the favour pulling both his legs when I go under his tesoura and he almost lands on his arse, but he knows how to fall too, and uses his hands to avoid a painful landing. We are told to swap again and I run to pick a pandeiro, but I was at the back of the class by the time I got there, only the agogo was left! I am now singing very loudly, and so are the others, if feels great, the energy is high now. I even started improvising with the agogo. Challenge yourself, player 1 does as many rabo de arraias, both directions, player 2 does cocorinha, esquiva. After a while, we get to do it. I partner up with a small, blonde girl, who kicks me on the side of my face! Luckily my head was following the leg, so the impact was minimal. And so, we have a very quick break, and then roda. The roda is basically the most amazing thing ever, just Mestre Cobra Mansa, playing with the higher students from Cordao de Ouro for just over 30 minutes. Before the roda started he did say it wouldn’t be possible to play with everyone, so I just got myself a place with a good view and prepared myself to watch live someone I had seen play on DVD so many times. It was dreamlike and cinematic! He must have played with twenty people, at least. WITHOUT A BREAK. He’s 53 years old! And each person he played with he taught them an important lesson, he showed he could have got each and everyone of them in a bad way. All with a beaming smile on his face. Pretty special… MUITO BOM! At the end Poncianinho and Mestre said some words, and then Mestre Cobra Mansa did a group hug which somehow he managed to make not awkward. He said we had all sweated together, and now our sweat was mixed and we were one. He said ‘cherish every day of your life, for each day is unique, even the bad ones, for we learn the most from those’. The journey home managed to be more epic and painfully slow than the journey there, as I stupidly thought that if I took the tube to Wimbledon and then a single bus home it would be quicker. In the end it took me 90 minutes to get home, but that’s another story.